Alright. So every once and a while, legendary Metal Blade records likes to revisit what made the label, well, legendary: classic heavy metal. Taking time out from adding another tattoo to his body (if there's any room left), Mirror was conjured up by bass player Tas Danazoglou (Satan's Wrath, ex-Electric Wizard). 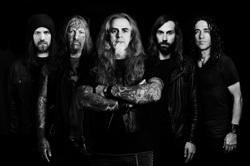 He's joined in this traditional metal quest by drummer Jaime Gomez Arellano, Satan's Wrath guitarist Stamos K, vocalist Jimmy Mavromatis, and guitarist Matt Olivo, from grindcore band Repulsion. Not sure how a grindcore guy ends up in an old school metal band. Anyway. Mirror is like a time warp to the late Seventies and early Eighties, a reflection as it were of traditional melodic heavy metal. You'll get parts of the New Wave of British Heavy Metal (NWoBHM) merged with doom, psychedelic, and simple American heavy rock. All this means, besides the heavy, sometimes sluggish, bottom end, Mirror works from music's defining elements, melody and harmony. You'll find this in the twin guitar harmony, both in riffage and solos. And solos abound here, being rather epic within songs like Heavy King and Madness and Magik, which also verifies Mirror as a "true metal" band. Additionally, and while I didn't have access to the lyrics, the trad metal band delivers themes of mystery, mysticism, and fantasy with titles such as Curse of the Gypsy, Elysian, and Cloak of a Thousand Secrets. Does that sound awesome or what? Actually, that song is one ripping riff rocker from the start, with a nice pace, and some whacked out psychedelic guitar buzz and solos. You get a bit more of that psychedelic feel, but mixed with a slower doom groove, in Year Of The Red Moon. Thinking of it, if I was writing this review on a Thursday, I might have called Mirror a Throwback Thursday band. Without little doubt they are channeling the best of classic early Eighties American heavy metal. Good stuff and recommended. 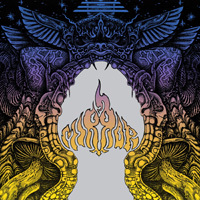 Without little doubt Mirror are channeling the best of classic early Eighties American heavy metal. Good stuff and recommended.